Since that time I have met various Christian groups who also were on the streets trying to convert others to their particular form of religion. Some taught that you must be filled with the Holy Spirit and speak in tongues to be saved. Some said that tongues was necessary evidence of your salvation. Some required that a person be baptised, by full immersion in water, before she could be saved. In every case, such doctrines depart from the simple clear teaching of the Scriptures. Those with false teaching always require some sort of works. They would say, yes, Jesus saves but you have to do this or that first, including additions like you have to continue to obey all commandments, or you must no longer sin anymore, or you will lose your salvation. They are adding to the true gospel. Matthew 19:14 But Jesus said, Permit little children, and forbid them not, to come to Me: for of such is the kingdom of heaven. Salvation is simple! (See note at bottom of this article.) But humans always want to add something of themselves, so that they might earn some merit, even just a little. Some, like one Seventh Day Adventist (SDA) guy, I once met on the street, argued that a Christian must meet and fellowship on Saturday in order to be saved. He even said that those who meet on Sunday are receiving the ‘mark of the beast’ and are doomed to Hell, because they are failing to keep the fourth commandment. Romans 14:5,6 One man esteems one day above another: another esteems every day alike. Let every man be fully persuaded in his own mind. 6 He that regards the day, regards it to the Lord: and he that regards not the day, to the Lord he does not regard it. He that eats, eats to the Lord, for he gives God thanks; and he that eats not, to the Lord he eats not, and gives God thanks. It doesn’t matter when you meet, as long as you do so to the Lord. Incidentally the disciples did meet on the first day of the week, Sunday (Acts 20:7,8). Here I am not wanting to attack any SDA believer because I know many love the Lord, but on this they are doctrinally wrong. The sign on a wall in Christian Nazareth says ‘Yeshua not Yeshu’. Note the small x denotes the missing ‘a’ in Yeshua’s name. Read right to left. Still others require that you must wear certain clothing, or that you must be vegetarian, or that you don’t eat anything that is considered unclean according to the Levitical laws of Moses. But none of those things or observances can save you anyway (Colossians 2:16-17). Acts 4:12 Neither is there salvation in any other: for there is no other name under heaven given among men, by which we must be saved. They claim that Christ’s name as ‘Jesus’ is a false name and is a lie — a deception. In Hebrew Christ’s name is ישוע and written as Yeshua in English characters. See table below. Historically His name in Greek became Iesous, which in Latin is Iesus, which eventually became Jesus in English because the ‘J’ was pronounced with a ‘Y’ sound. Jeremiah 33:3 Call to me, and I will answer you, and show you great and mighty things, which you know not. The greatest of these is heaven itself. Now Acts 2:21, quoting from Joel 2:32, says that it finally came about that all a person needed to do was to call on the name of the Lord to be saved. The scripture does not require you call out loud; it could be a silent prayer. Nor does it require you use Hebrew or any other language, nor is it a requirement to pronounce Jesus’ name correctly in Hebrew. But the text does tell us “whosoever shall call”. That is all that is necessary. And what if you were not sure about God. And I know that, because that is what happened to me. Forty odd years ago I prayed “Lord, if you exist, help me!” and He did and He revealed Himself to me. Nothing else was needed, no water, no calling the name YaHshua, no baptism of the Holy Spirit (though I did get that over a year later). Torben Søndergaard (of The Last Reformation group) claim only those who have been fully immersed in water and come up speaking in tongues are alive in the Spirit. Torben says that they have received the Holy Spirit and the tongues speaking is evidence that they are saved. They make baptism in water a prerequisite to salvation. He said that the Reformers failed to get the correct message over. It would seem that he now thinks he has the right way, and he is there on YouTube teaching the so-called ‘correct way’ to salvation. Dunk people in water and if they come up speaking in tongues they must be saved! Man always wants to add something. Many have a hard time just trusting that God knows what He’s doing. So they preach another gospel, and it always includes some works. Matthew 7:21-23 Not every one that says to Me, Lord, Lord, shall enter into the kingdom of heaven; but he that does the will of My Father who is in heaven. 22 Many will say to Me in that day, Lord, Lord, have we not prophesied [spoken] in Your name [meaning ‘Jesus’]? and in Your name have cast out devils [demons]? and in Your name done many wonderful works? 23 And then will I profess to them, I never knew you: depart from Me, you that work iniquity [unrighteousness]. So there will be those who do miracles, apparently, speaking in Jesus name, and even casting out devils in Jesus’ name, but the Lord said He doesn’t know them. That means these people are not saved. They are not regenerated Christians, but they will have the appearance of the true thing, except they are not saved. Here is another warning from Christ. Matthew 24:24 For there shall arise false Christs, and false prophets, and shall show great signs and wonders; insomuch that, if it were possible, they shall deceive the very elect. The elect are the true brethren, the saved believers. The false prophets’ signs and wonders must be a good copy of the genuine article if we are warned that they could almost deceive the elect. So, how do we tell? It is quite simple really. We check everything that they teach against the Word of God. If what they teach is in conflict with sound doctrine then they are a false teacher and could well be deceived themselves. And it makes no difference if someone gets healed from some physical affliction because, if they are deceived into believing they a born-again into Christ, yet, in fact, are not, then the physical healing is of little eternal consequence. The greatest miracle of all is the eternal salvation of souls. This is highlighted by the fact that the Apostle Paul prayed for the death of a believer in the Corinthian church, who had seriously sinned (1 Corinthians 5:5), meaning that in death he would be saved yet he no longer could continue in sin. The truth is that salvation is simple. Jesus said it: repent and believe! John 3:36a He that believes on the Son has everlasting life. There are no pre-conditions. And the word ‘repent’ (from the Greek μετανοέω metanoeo) doesn’t mean to stop sinning as some falsely attribute. It means to think differently or to change your mind, to turn it to God, in this case. The word ‘believe’ (from the Greek πιστεύω pisteuo) means to have faith in (a person). It is God then that does the work in you to save you–helps you to believe (John 6:29). 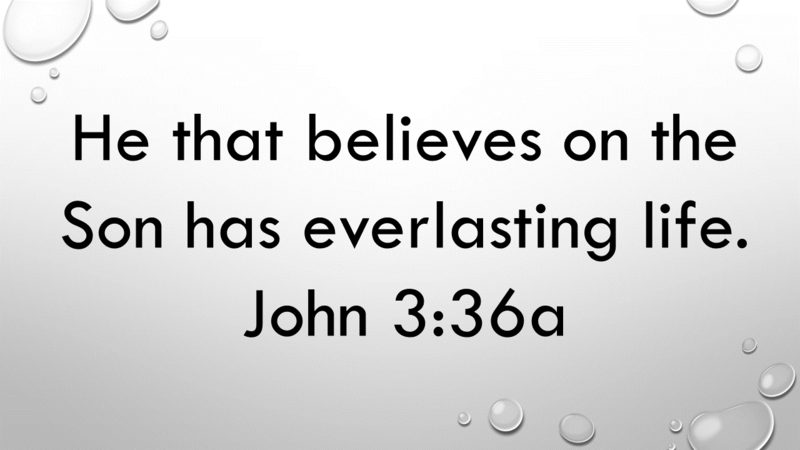 Thus you have everlasting life, from the moment on that you believed. Jesus, speaking to the Ephesian church, told them to remember where they fell into sin and to repent else they would not be saved (Revelation 2:5). Apply this to ourselves and we’re to contemplate our sins, our wicked hearts, to turn them to God and to do our first works, which is to believe in Jesus Christ. John 6:29 Jesus answered and said to them, This is the work of God, that you believe on Him whom He has sent. First works are not water baptism or anything else, otherwise it would not be salvation by grace and grace alone (Romans 11:6). So if the alleged miracle worker is not teaching simple salvation with repentance, without adding anything else, without requiring you use the name YaHshua or fellowship on the Sabbath (Saturday), or without requiring water baptism or Holy Ghost baptism, then he is deceived. The Son of Man (Jesus Christ) came to seek and to save the lost (Luke 19:10); even the little children who believe are saved. Note: I think I should clarify that in the choice of the title “Salvation is simple”, I do not mean to imply that all one has to do is pray a prayer (or raise your hand in affirmation in a church meeting) and then you are saved. It is God who saves. No human can save himself. Some teach, erroneously, that all you have to do is pray a prayer and believe, or say the words “I believe”, and in support of their claim they often quote Romans 10:9,10. That if you shall confess with your mouth the Lord Jesus, and shall believe in your heart that God has raised Him [Jesus Christ] from the dead, you shall be saved. 10 For with the heart man believes to righteousness; and with the mouth confession is made to salvation. But that would be misleading. It is true that such a prayer might lead to someone’s salvation. But if so, they would manifest works (loving and seeking God, sharing the gospel with others etc) but they would not continue with their life as if nothing happened. But the true born-again believer, though still a sinner, will acknowledge his/her sins before God, and seek to live a holy life, obeying God’s commandments. The believer is not ashamed of the gospel and openly confesses Christ to the unsaved. Romans 10:11 For the scripture says, Whosoever believes on Him [Christ the Lord] shall not be ashamed. Remember that the Lord Jesus Christ warned against those who say “Lord, Lord” and claim they do “religious things” but, in fact, are not saved. Matthew 7:22,23 Many will say to me in that day, Lord, Lord, have we not prophesied in Your name? and in Your name have cast out devils? and in Your name done many wonderful works? 23 And then will I profess to them, I never knew you: depart from me, you that work iniquity. Repent and turn to the Lord Jesus Christ! Can you do anything to be saved? What biblical repentance is not! What is the meaning of Repent? This entry was posted in Belief in God, Biblical doctrines and tagged Ellen G. White, miracle workers, name of Jesus, Sabbath keeping, SDA church, simple salvation, Torben Søndergaard, Yeshua. Bookmark the permalink.